Sometimes in life you need to appreciate some of the people who have performed beyond your expectations such as students, staff or volunteers. A certificate of appreciation could be presented to them as a thank-you and as a recognition of their hard work. A certificate is a physical object, and will be there to remind them of the hard work that they have put in, and the gratitude you extended to them. To actually create your own certificate that will delight the recipient – it’s surprisingly simple, and all you need to do is follow these instructions. The first stage in creating a certificate is to document the information that you want on the front of it – remember to do this clearly and think about giving certificates to different people or for different reasons. As you are reading this on the internet, I hope you have access to either Excel or Word – use these applications to input the details that you specifically want to show for each person’s certificate. By saving somewhere you can easily pull up the file again when you need to edit it or print off new copies of a certificate. Step two is to create the first draft of the certificates that you want to present. Here, you will be calling on your creativity when designing the certificate through a DIY design process. You will want to begin with using nice clear graphics, and laying out exactly how you want the content to be presented. 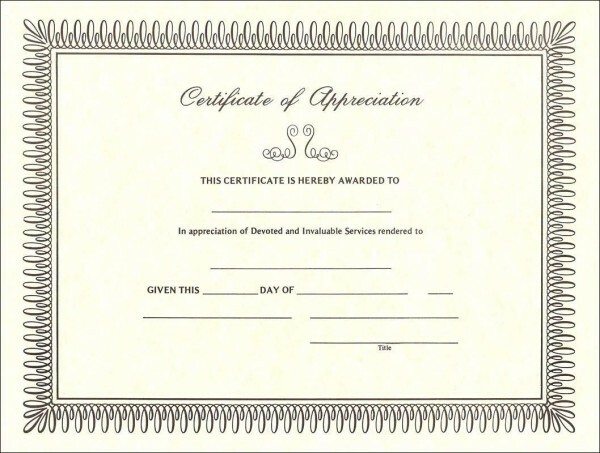 If creating original graphics is actually too hard for you, then definitely you should consider searching the net for a free downloadable appreciation certificate template. After shortlisting several templates that appeal to you, you can the personalize them using the different online tools provided on the template’s website. If you wanted the certificate to be personalized to your company, and completely unique then you should consider utilizing the services of a graphic design company. In using the graphic designer, be sure to give all the required details and negotiate on the price. Also, as this is a template, remind them that you will want to be able to change the details such as name, date etc and make sure this will be possible for you to edit. The 3rd step in this process is to enter in the personal information onto each specific certificate. When you are entering the information into the template, you need to consider the person who is receiving it and the reason for giving it. This will help you choose an appropriate style and color of font to use, aligning the certificate with the reason and the recipient. The choice of paper and the printing style of the certificate (laser, inkjet etc) are also important factors that should be decided upon by considering the reason for the certificate and the recipient. Wrong choice in paper, design, graphics, color and print quality might undermine the level of appreciation intended. To finish this guide, the last step if to present your certificate in the best manner possible. Have the certificates packaged well, so that they avoid any damage and so that they increase the meaning of importance. Another point to note, is that the way that the presentation is carried out must be considered. Choosing how you deliver the certificate of appreciation can also have an impact. Usually certificates are mailed in the post, presented face to face or given at a presentation ceremony. If you do mail the certificate, it can appear to be impersonal but it’s a handy way to deliver a certificate if the presenter has trouble in meeting the recipient. The face-to-face presentation depends on the availability, or the ease of meeting the recipient, while events presentation can be done to a group in functions such as thanks giving events, or any other event that relates to the work done. Hopefully you will find this guide on customizing your sample certificate of appreciation useful, if you have any great suggestions or want to share the certificate you have created, then please get in touch with us via the contact page.